"Free at Last, Free at Last"
A pair of metahuman lovebirds have just killed everyone within a convenience store before heading off east. 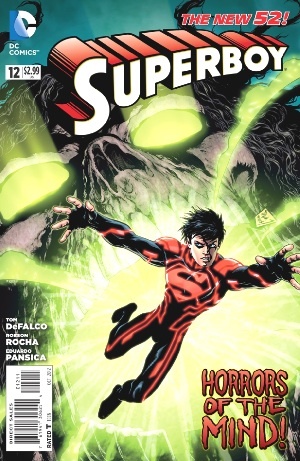 As Pen 51 crashes towards the earth's core, Superboy figures out that his powers only seem to work when he's aware of danger and thinks about using them. He makes his way back to the surface as Zaniel admits to Red that he may have premature allowing Superboy out of the lab. Rose Wilson and Red have a psionic discussion before Rose heads down to find Superboy. Red admits N.O.W.H.E.R.E. has no idea who or what she is. Superboy crashes up through the ground startling a young couple making out. They're scared of him because he's a metahuman. Superboy is attacked by one of the inmates of Pen 51 who senses his part human and part Kryptonian. The female creature melts away before Superboy can find out more. In her apartment Red is surprised by Superboy's appearance. She grows into a larger, muscly version of herself, and grabs Superboy by the throat. "Wise Men Need Not Apply"
Dr. Caitlin "Red" Fairchild has Superboy pinned down. Impervious to his TK powers, Superboy instead brings the ceiling down on top of her. A N.O.W.H.E.R.E. operative named Centerhall enters with a support team who carry Red off as she was a Gen 13 mole. Centrehall explains to Superboy that nobody really knows who the human donor was for that part of his DNA. Centrehall gives Superboy his freedom if he'll come in to capture Wonder Girl when they call him. Bemused by the faith shown by Christmas Carolers, Superboy lashes out at them before flying off and setting fire to a city Christmas tree. Elsewhere, at a fancy party the two meta-human lovebirds have killed all in attendance except the musicians. Superboy flies past as one of the musicians is thrown from the highrise building, and decides to save the man. He confronts the two meta-humans and actually enjoys being able to unleash his powers on beings as powerful as himself. With the villains captured and in the custody of N.O.W.H.E.R.E. 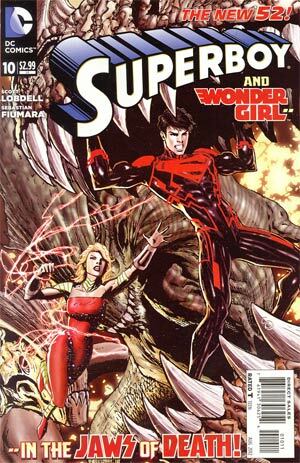 Superboy agrees to intercept Wonder Girl before she meets up with Red Robin. Superboy's strength and powers are far beyond what N.O.W.H.E.R.E. 's equipment is able to measure. Dr. Umber is now head of the project, and Zaniel Templar reveals he's some kind of creature himself, and kills all the technicians around Umber in his frustration. Rose Wilson returns and is upset at what's happened with Caitlin "Red" Fairchild. She searches Red's quarters and discovers a memory drive. Meanwhile Red is being transferred via a fake delivery truck, but Superboy (in disguise) attacks the truck to rescue Red. An unseen friend promises to keep her safe. Rose discovers information about herself and a top secret "Colony" project. Zaniel storms in to Superboy's quarters certain that Superboy was somehow involved in Red's escape... even though he has no proof. Elsewhere the two metahuman psycho lovebirds are being taken care of on some strange farm by people helping out with the "Culling". Having defeated the Teen Titans, Superboy takes his frustations out on N.O.W.H.E.R.E. 's surveillance truck. As he flies off he runs into Supergirl, who asks him in Kryptonian who he is. When she touches him he is bombarded with historical images and knowledge of when Krypton was at war with clone armies. He's also suddenly able to speak Kryptonian and Supergirl calls him "Kon-El" (meaning Abomination of the House of El) when he reveals he's a half human-half Kryptonian clone. She attacks him before Superboy stops her and asks her to explain why she called him that. Their conversation is interrupted when a police helicopter starts firing on them. While Superboy deals with the chopper Supergirl flies away. She wonders why Kal-El never mentioned Superboy to her. Superboy flies off to confront Templar at the N.O.W.H.E.R.E. base, but he is confronted by Rose Wilson. Superboy crashes through Rose Wilson, before using his powers to cause destruction that will evacuate the N.O.W.H.E.R.E. base with no casualties. 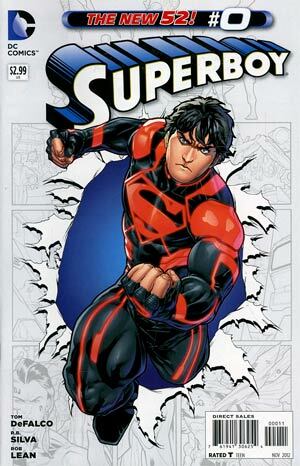 A life-form known as Danny The Street tries to warn Superboy away, but he just brushes it off as a hallucination. Superboy discovers his birthing pod, and sees it is number 02, meaning he wasn't the first clone. A shadowy figure looks on from his throne and is surprised it took Superboy so long to figure out he wasn't his first effort. Rose takes advantage of Superboy's shock and attacks him once more, shooting him with a Kryptonite ray which doesn't seem to have any effect, but then she stabs him with her sword. 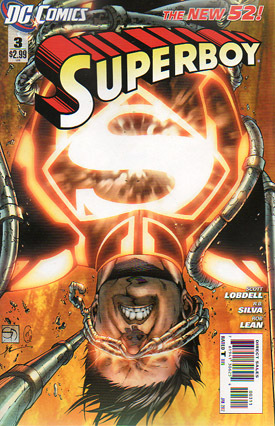 Unconcious Superboy awakens to find himself trapped in a machine with Templar and Centrehall ready to disect him. Elsewhere, Caitlin "Red" Fairchild awakens in Detective Jocelyn Lure's apartment where she learns Superboy saved her. But Red thinks he's ruined everything. Back at N.O.W.H.E.R.E Rose prepares to leave after capturing Superboy, but she's confronted by Wonder Girl, who knocks her out. Superboy is being smacked around by a Ravager called Grunge, who is able to metamorph using anything he can see thanks to implants inserted inside him by N..O.W.H.E.R.E. Grunge breaks Superboy's arms. In Manhattan, Caitlin "Red" Fairchild breaks into STAR Labs to borrow a shuttle pod. Back at N.O.W.H.E.R.E's labs, Rose Wilson is attacked by Leash, but Solstice talks her down before she can do something she'll regret. 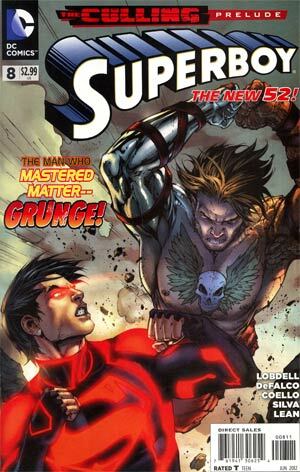 While Superboy's TK powers don't work on Grunge himself, he uses his powers to violently extract Grunge's implants right out of his body, before collapsing from his own injuries. Harvest finds Superboy, and Rose brings Solstice to him as well. Terra and Beast Boy make an appearance. 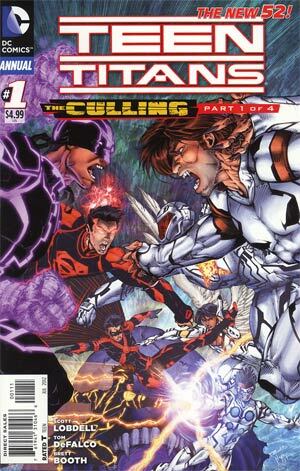 The Culling - Part 2: "Lost Claws"
Superboy and the Teen Titans team up with the Legion and the Ravagers to battle Warblade and the rest of Harvest's teen metahumans. Superboy tries to take out Warblade himself. 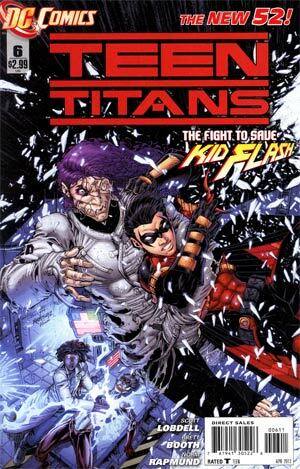 Rose Wilson attempts to kill Robin, but he's saved by Kid Flash. The Legion appear to recognize Kid Flash from their own time period, but he has no idea why. Warblade kills the male metahuman Superboy met in Metropolis before he is knocked out by Dawnstar. With his minions defeated Harvest arrives in person to take matters into his own hands. "The Mysterious Mystery of Mystery Island"
Superboy and Cassy wake up on a mysterious island which is shaped like a Question Mark. Superboy wants to fly back to America, angering Wonder Girl who isn't ready to give up on her missing friends. While they're obviously attracted to each other, Cassy can't let go of the fact that Superboy once tried to kill her. A giant T. Rex chomps down on Superboy. Cassy saves him and together they knock out the dinosaur. As it gets dark Superboy makes a fire while Cassy collects fruit. Superboy tastes food for the first time... and loves it. As they share their back stories, Superboy moves in for a kiss, but instead gets a punch in the face. They notice the T. Rex is missing, and discover a strange wooden door in the ground, that leads to an upside down island on the other side. Superboy shows Bunker his new apartment, which he is able to pay for from money he "borrowed" from banks. 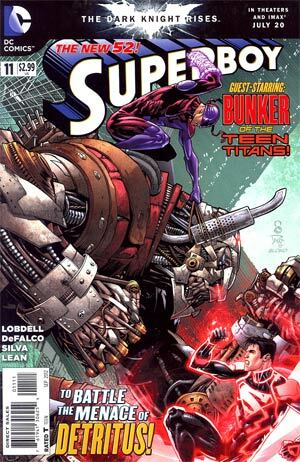 An uneasy Bunker takes Superboy out into the city to experience life for himself. Bunker gets a brick tattoo while Superboy gets an "S" tattooed on his arm. A disturbence out in the streets leads the boys to costume-up and take on a creature calling itself Detritus, who is able to grow and reform using machine parts around him. Detritus tries to convince Superboy they are more alike than not, but it's a ploy to try and consume Superboy's power. The Teen of Steel smashes the android to bits. Kon-El goes out to a nightclub with Bunker and his new landlady, Dallas Sorrentino. Kon has his first alcoholic drink, and it affects his powers. When a strange redheaded woman walks in, Dallas tries to make an escape. 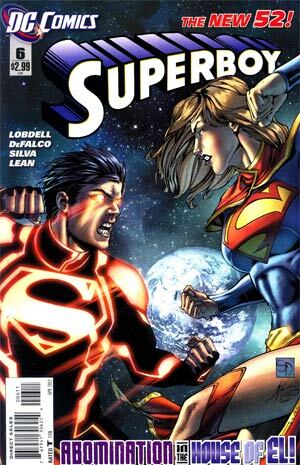 Superboy follows and finds Dallas being troubled by the redheaded woman named Kira, whose thugs are man-handling Dallas because of a "debt" she owes Kira. 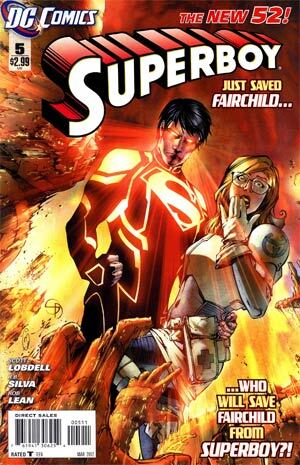 Superboy tries to stop them, but he finds his mind and reality altered by Kira's own powers. He uses his powers to rid himself of the alcohol in his system, which helps him to realize that Kira is using his powers against him. He gives in instead of fighting, and this lets Kira all the way in, which works against her as she's horrified by what she sees within the Boy of Steel. Kira and her thugs make a quick getaway. Elsewhere Detective Lure is looking at Superboy's short history, and declares she will either become his teacher or executioner. Hundreds of years ago on Krypton, the clone known as Kon raised an army of clones to rebel against their makers and wage a destructive war that killed hundreds of thousands. Kon's destruction of Krypton's climate control technology destabalized the planet, leading to its destruction. In the recent past, Harvest watches on as the Superboy clone is grown and studied within N.O.W.H.E.R.E. 's lab, recalling how Krypton's cloning came about and grew, until the clones rebelled. While Kryptonians ended up winning, the planet was devastated, taking decades to recover. A Doomsday Cult emerged, ensuring that Krypton's space program was dismantled, as they looked forward to the planet's total annihilation. Harvest is pleased that Superboy shows no signs of being a hero as Caitlin Fairchild puts him through VR scenarios, never realizing that Harvest himself is imbedding aggresive images into Superboy's mind, evening pitting him against Superman. Superboy wakes to find Jocelyn Lure in his bedroom aiming a laser gun at his head. As a police officer she wants to know about all the stolen cash in his apartment. He grabs her and flies away so they can chat. He wants her to keep her promise and help him find Caitlin 'Red' Fairchild. Elsewhere the attackers that had tried to kidnap Dallas from the nightclub are nursing the comatose Kiva. The leader of the gang wants Dallas' "protector". The next morning Superboy and Dallas go shopping. Jimmy Olsen arrives in New York on assignment from Lois to learn more about this 'Superboy'. Superboy is accosted by two goons known as Bonesmasher and Streak. The fight brings in the police who go after Superboy. He just wants to be left alone. Dallas realizes her friend is a superhuman. Jimmy reports back to Lois on Superboy. Gas pours through the streets knocking everyone out while also blocking everyone's view. Superboy is ushered into an alleyway by Lure who assures him the gas will erase the public's short term memory. 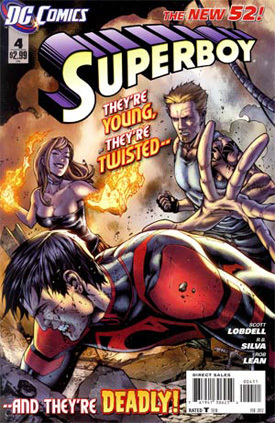 Lure opens a portal leading Superboy to Caitlin Fairchild and The Ravagers. Caitlin and Superboy reunited - and that's not a good thing for Ridge! "Better to Burn Out... Than to Fade Away"
Kid Flash manages to escape the facility with Solstice only to find themselves in the Antarctic. In the Badlands Miguel Jose Barragan (aka Bunker) boards a train and finds himself in the company of Red Robin and Skitter (inside a cocoon). 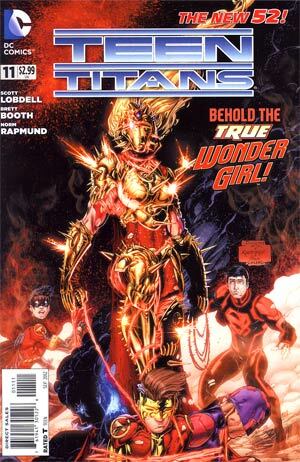 Wonder Girl questions one of the three Thrice brothers in an LA hospital. The train Red Robin and Bunker are on comes to an unscheduled stop in a town where the people are a mindless mob. Robin discovers they're being controlled by a metal being called Detritus, but he wipes his existence from Robin's mind before leaving. Back at the train Skitter comes out of her cocoon unsure of where she is. 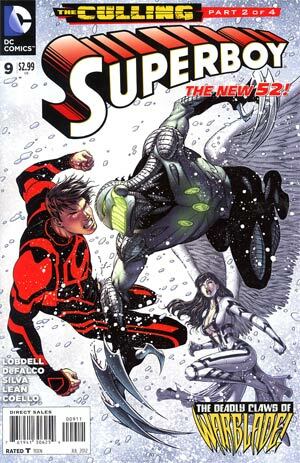 Solstice and Kid Flash arrive at a town that's quickly covered up by the ice and snow. It's New Year's Eve and Cassie is confronted by Superboy. Robin talks with Celine and Miguel on the roof of his apartment at Lextower when the doorbell rings. Somehow Kidflash and Soltice are at the door. Superboy and Wonder Girl battle it out in Time Square. Miguel and Solstice strike up a friendship. Robin and Kid Flash argue over a sweater before the group notices Cassie's fight on the TV. 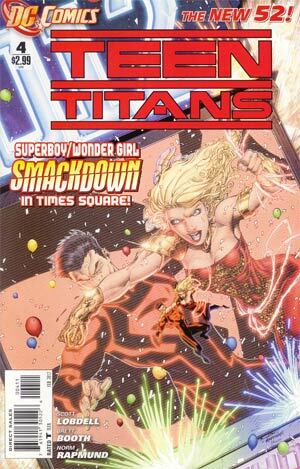 Superboy gets the upperhand in the fight, but the rest of the newly formed Teen Titans arrive on the scene. 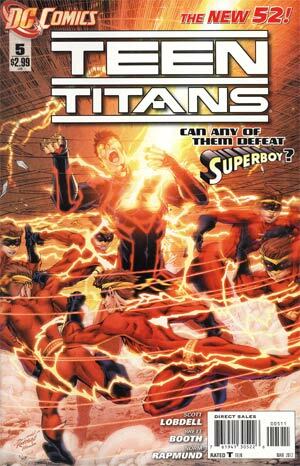 The Teen Titans attempt to attack Superboy, but they didn't count on his tactile telekinesis. Kid Flash uses his speed to pummle Superboy with punches, Superboy just sends him into a spin that Kid Flash is unable to withstand. Wonder Girl uses a super kick to save Kid Flash, but he's sent flying miles into the air. Solstice goes off to save Kid Flash. Wonder Girl is smashed into the ground by Superboy. Bunker tries his purple brick gloves on Superboy, but he too is soon knocked out. Solstice has to shear a navy aircraft carrier in two to save Kid Flash from a deadly crash. In the mobile N.O.W.H.E.R.E. facility they inform Mr. Templar about the situation, but he claims Superboy can manage. Keeping Superboy distracted with his questions about why he's working for N.O.W.H.E.R.E. and what their plans are for the teen meta-humans they've been collecting, Red Robin is able to get the better of his opponent... but not for long. Wonder Girl wraps her unbreakable rope around Superboy, but he just uses it to drag her down in to the subway, in the path of an on-coming train. Solstice tells Superboy about what N.O.W.H.E.R.E. did to her. He headbutts her before flying off to throw the mobile N.O.W.H.E.R.E. truck into the river. He heads off to confront Mr. Templar for the truth. The Teen Titans are confronted by the police and a detective Jocelyn Lure who wants to arrest them for the destruction caused by their recent fight with Superboy. Skitter arrives out of nowhere and takes out the police and grabs Lure, but before she can do any real harm Red Robin knocks out the detective with a batarang. Kid Flash's powers are going crazy, and the team rush him to STAR Labs in Manhattan where Virgil Hawkins (aka Static) agrees to help. In a cell within STAR Labs a metahuman villain known as Grymm uses his abilities to take control of Skitter. Detective Lure (who isn't who she claims to be) looks at a file from the future in reference to Kid Flash, who also isn't who he claims to be. Back in STAR Labs Grymm is freed by Skitter and attacks Wonder Girl and Bunker, but while he controls their bodies, Bunker uses his mind to sucker punch Grymm and knock him out. Virgil presents Kid Flash with a new costume, which will keep him alligned and control his powers. As Director Centerhall goes about killing Superboy, he's interrupted by the arrival of the Teen Titans, who have come to rescue him. Seems Red Robin was able to talk the other team members into saving Superboy because they're against anything N.O.W.H.E.R.E. does. 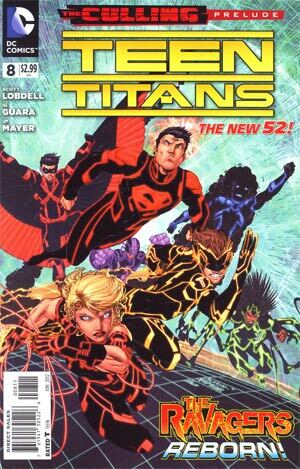 Kid Flash, Bunker and Skitter grab Superboy, while Wonder Girl is confronted by Zaniel Templar. As Robin is hacking into N.O.W.H.E.R.E's database on teenage meta-humans, he's questioned by Soltice as to his motives. The team are aided by Danny The Street (a metahuman who appears as a street with teleporting abilities) and they're all set to escape, except Soltice isn't with them. Robin is willing to leave her behind, but the rest won't go along with that. They're discussion is interrupted when they are attacked by the creator of N.O.W.H.E.R.E, who goes by the name Harvest. Inside N.O.W.H.E.R.E. 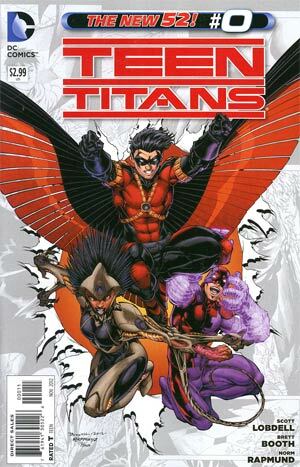 's headquarters, the Teen Titans face off against two of Harvest's minions, Omen and Leash. 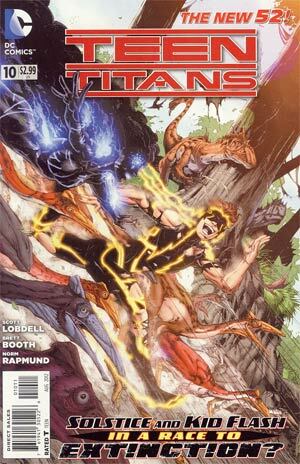 One by one the Titans are pulled into Omen's mind-probes, revealing their inner fears and secrets. 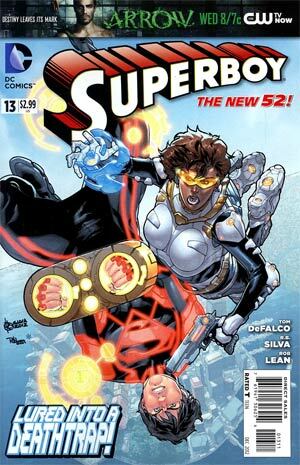 In New York City, Amanda Waller and Agent Kurt Lance investigate the damaged ship that Solstice sheared apart during the team's fight with Superboy. Meanwhile, the pressure of their impending assimilation is causing in-fighting among the Titans. Despite all their attempts, they simply can't escape, and Omen's mind games making our juvenile heroes believe things that are untrue only add insult to injury. The only thing the Titans can do is roll with it, give up their collective sobriquet, and become the New Ravagers. The Teen Titans find themselves in the Crucible, where Harvest has trapped hundreds metahuman teens. Amongst them is a motley band of humans and metahumans, namely Artemis, Lightning, and Thunder. Red Robin befriends these three and learns more about the Colony and Harvest's master plan: to weed out the weak and recruit the strong to become his Ravagers. The Legion Lost is trapped elsewhere in the Colony, and despite their incredible powers can find no way to escape. Leash thrusts the Titans unto the Legion, pitting the two teams against one another. 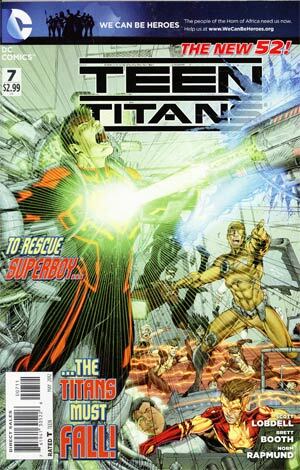 Leash gathers more of the trapped teens, including Artemis, uses his powers to enrage them, and sics them on the Titans and the Legion. The two teams set aside their own fisticuffs and take on the new threat, careful not to actually harm anyone. In the confusion, Artemis is killed. 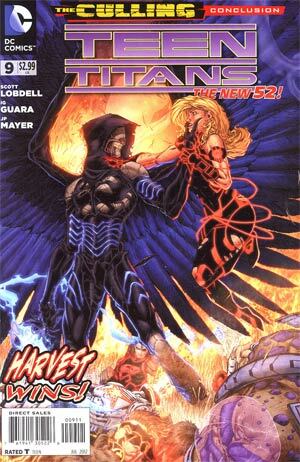 Red Robin realizes the futility of the fight and vows to take down Harvest. With the fight won, Harvest commands his troops to go forth and reap the dark winds. The Culling has just upped the ante. Members of the Titans and the Legion battle Harvest. Meanwhile, the rest of the two teams are scurrying to get the injured meta-teens into escape pods. They're helped by Red and Terra, former supporters of N.O.W.H.E.R.E. Skitter is still missing and Bunker is hesitant to leave without her. The Legion gets to work and destroys the central core. This gives the Titans fighting Harvest the advantage they need. The crippled core begins debilitating the Crucible, sending Harvest, now revealed to be human, fleeing. Those left in the compound begin their hurried escapes. For the Legion, the discovery of a Time Bubble appears to be the ticket home to the 31st century they've been searching for. With Harvest escaped, the Titans rely on the combined efforts of Superboy and Wonder Girl to get them all safely to the surface. When they come to, they find themselves on a beach in the midst of dinosaur-like monsters. The Teen Titans find themselves on a mysterious island full of prehistoric creatures. 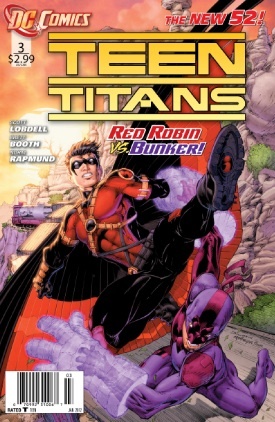 Red Robin is chastised by Bunker for his "crisis of leadership." Wonder Girl and Superboy find the rest of the team, and they get cozy in a pristine pool beneath a waterfall. Red Robin announces that the Teen Titans are done. Kid Flash and Solstice get romantic. Back at the pool, Superboy and Red Robin make up, while Bunker makes the unfortunate discovery of Danny the Street, completely in pieces and badly hurt. Using a message in a bottle, Danny tells the Titans his final act of heroism will be to transport them off of the island and back home. Back in civilization, the Teen Titans mourn the death of Danny the Street. In Washington, DC, Amanda Waller seems at her wits' end. The teen meta-humans have been a nuisance for too long. She's calling in the Gardener. Operation: Meta Dead Stop has been activated. "Wonder Wonder Who"/"When Dinosaurs Walked the Earth"
While Kid Flash, Bunker, and Solstice take on a creature called Loose Cannon, Cassie Sandsmark is dealing with the fact that the Silent Armor she wears hurts like hell. At the Museum of Natural History a floating, naked man remarks that he's finally found Wonder Girl. Elsewhere, Superboy is hanging out at his new apartment with some deer-eyed floozy when he notices that Lex Towers has gone dark. He slips away from the blindly adoring lass to see if all is well with the Titans. 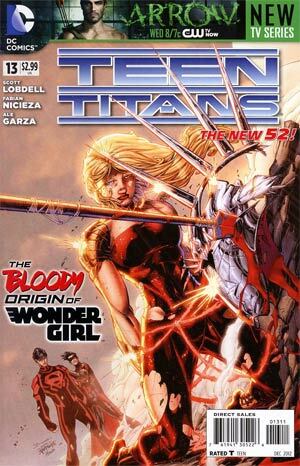 Superboy catches up with Red Robin on the way to the Towers where they discover Wonder Girl kneeling in full Silent Armor regalia, the other Titans KOed around her. The Silent Armor thrusting and bursting through her flesh, Wonder Girl begs for help, but not to ease her agony, rather to stop her before she kills... again!/Stepping out of a dark alleyway, three bipedal dinosaur-like beings get ready to explore Chinatown. Bart Allen happens to be enjoying a few noodles when he notices the ruckus. He zips into his alter-ego attire and assesses the situation. The alleyway from where the three creatures lurked: the late Danny the Street, now honored as Danny the Alley. It looks like the Teen Titans brought something back with them from Mystery Island. Superboy and Red Robin try to take down Wonder Girl, who is now entirely under the influence of the mysterious Silent Armor. Meanwhile, in a off the New Jersey Turnpike, the rest of the Titans are coming to terms with the facts of being part of a team. Tim and Kon get the better of Wonder Girl allowing Kon to use his telekinesis to tear the Silent Armor from Cassie's body. It's a short lived victory, though, as a tall, dark, and handwringing lunatic from Wonder Girl's past shows up. 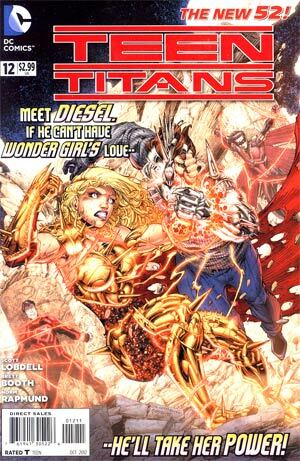 Using a "paralytic gas" to avoid conflict with Kon and Tim, the formidable Diesel confronts his old flame, subdues her, and takes control of the Silent Armor, and flees. Soon, Kon and Tim come to and find a raging Cassie. She insists the Silent Armor is a dangerous weapon and the burden of being its host must fall to her. There's no choice: they have to track down Diesel and get the Armor back. Tim Drake is a talented young man. He excels at gymnastics. He's a computer whiz. He has scholarships pouring on his lap. What's more, he has proud, loving parents who support him in everything he does. Despite all this, Tim needs more. He needs to be Batman's partner, and he's made some stellar efforts in finding out just who the Dark Knight really is. Unfortunately for Tim, all the clues that bring him to the identity of the Batman were all planted - by Batman. Batman refuses Tim's application for the job of Robin. Not easily dismayed, Tim takes to his own methods of crime fighting, mostly to get Batman's attention. However, his approach - steal from the rich, give to the poor - proves a tad dangerous when he steals from the Penguin. Batman arrives at Tim's house just in time to save the would-be do-gooder and his parents from the Penguin's trigger happy goons. When the dust settles, Tim's folks enter the witness relocation program to stay safe from the Penguin. They don't want the same life of anonymity for Tim, and so ask Batman to look after the young man. Painfully the Drake family parts, leaving Tim to a new life, full of opportunities that rival those he's had to leave behind. Enter, Red Robin. Cassie Sandsmark recounts her time following her mother on archaeological digs, and how in China, she met Diesel, a hunky, mysterious fellow. The two hit it off and sneak around the world following Cassie's none-the-wiser mother, Helena. While in Cambodia, Helena discovers a dig site, abandons it for another, prompting Cassie to curiously return to the former site. Cassie figures Diesel is at the first dig site. While there, she discovers a massive chamber just yards from where Helena had stopped the dig. Diesel gets consumed by the Silent Armor. Trying to help, Cassie snaps on a pair of gauntlets she finds nearby, and the Silent Armor is attracted to her. This doesn't sit well with Diesel, who threatens Cassie into giving the armor back. Just then, the chamber collapses, a boulder apparently squashes Diesel, while Cassie uses her lariat to swing out of danger. Cassie, Red Robin, and Superboy return to the site of the chamber to investigate. Meanwhile, deep beneath Belle Reve Prison, Amanda Waller is still turning the dials and charging up the electrodes on Kurt Lance. Hold on to your socks, Lance is on the job.